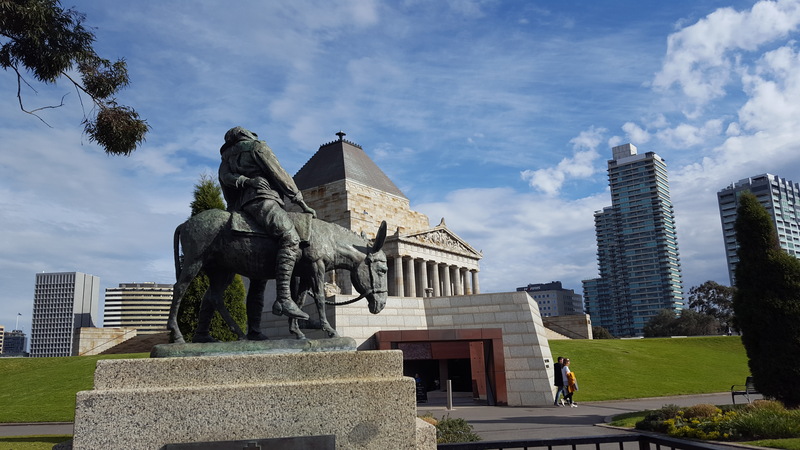 I recently visited the Shrine of Remembrance, Victoria’s war memorial (in Melbourne) the other day. I had not been before and I decided I needed to. Mainly for the quiet, but also because of Dunkirk. Then again, a good reason is because of the news lately. So I wandered the galleries and visited the crypt and sanctuary because of these things but also for another reason. For a while now my grandfather has been on my mind and since it was recently Father’s Day in Australia it all felt timely. Not that my grandfather was Victorian. But it doesn’t matter. He was a veteran. This May gone my mother’s father would have been 109. His world was almost entirely different to mine, and his life seems so long ago. I recall stories of him panicking about getting home from outings before nightfall, when it was 3pm. In summer. Much later, the last years of his life were becalmed with medication for his anxiety that was also complicated by Alzheimer’s. Grandpa, I hardly knew you when you were forgetting yourself. His legacy of worry is another reason I think about him. Whether it was something innate, or something about his World War Two experiences that meant he never let go of the worries we can’t know, not now. Maybe I should hang on to worry, as something from him, to me? And I think of him in his quiet dignity, his early mornings in his retirement, his loyal (and non-PC-named) dog Gyp. I can see the glass bottles of Halls Lemonade perched with me on the hot vinyl seat of his Holden over summers I stayed at my grandparents quiet bungalow opposite the decaying corner store/post office Grandma once ran. I can see in my mind’s eye even now the empty corrugated iron shed that was the train station, and taking the silver train as a tiny kid. Years later, when moved into a retirement village, Grandpa was properly diagnosed when he became confused and tried to go back to the country. His old Holden no more, he headed north, walking along the freeway. There was no other way. By then, the train had been gone maybe 20 years. Google Maps labels the old track a ‘riesling trail’ now. He couldn’t go back, and in fact never did. A couple of years later, he died. I took an interstate bus from university to the funeral in the city he was never at home in. They played We’ll Meet Again. …At least I think they did. It was twenty-one years ago and my memory isn’t what it was either Grandpa. Time wears the edges of the shapes of the blocks which build myths. 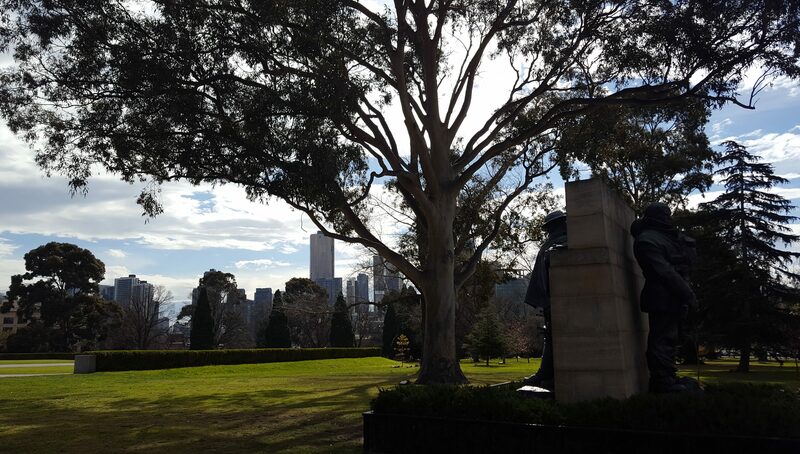 Building blocks of myth at the Shrine of Remembrance park. Grandpa would’ve been more interested in the trees. My maternal grandfather, who outlived my paternal Pop by two decades, and my mother by three years, had lived and died almost a stranger. His anxiety, his Alzheimer’s Disease, progressing even when I was young, made him more intimidating to me as a small child than he deserved to be thought of. He was, in all respects, according to my memories of my mother’s stories, a kindly, if slightly unworldly, rural man with an affinity for animals. He made green things grow in dry heat and red soil. However, I’ve found out more through the RSL Virtual Memorial. Where he enlisted, where he fought and who with. Facts and not stories, for there are no stories. Or perhaps one: a snippet about being on armed look out for sharks and crocodiles while his mates swam in New Guinea. I don’t know how I came by that story, because, for himself, he never marched nor marked ANZAC Day or any other memorial. I never heard him speak about it. But why would I? I was a kid. 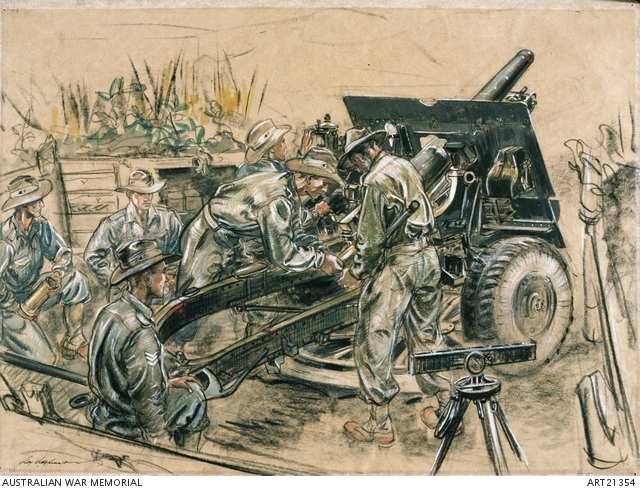 By Roy Hodgkinson: WWII New Guinea. Unidentified members of the Royal Australian Artillery, 2/14th Australian Field Regiment. The facts are these: my grandfather was a Gunner in the 2/14th Field Regiment, formed from South Australians from the 28th Battery. His regiment, the 2/14th was the only major combat unit of the 8th Division not captured by Japanese forces in New Guinea. The only one. The perpendicular break signifies the Broken Eighth Division. This is more than he ever mentioned. For all I can tell under those slouch hats that’s him featured on the regiment’s own Wikipedia page. I remember Grandpa, and suspect the entire world is traumatised. From the most basic cellular components to our complex societal and natural systems, compounded upon each other, and proliferating through generations. Perhaps Alzheimer’s was a relief after working so hard to move on. Perhaps he finally did forget? I worry about so many burdened with the weight of sorrow and pain. There are so many tired, and angry and fearful. Whatever made my grandfather kind, today looks like it makes people mean. It leads them to clutch at straw ideologies amid terrible nightmares, when he lived the reality. I worry that there maybe peace deals but wars don’t really end. The anger and despair that leads to violence moves elsewhere, like a virus. Survivors carry their scars and some, in turn, scar their children, who then unlearn the lessons obtained earlier, to foment more unrest. It’s physics. Actions and reactions in a closed (and broken) system. Our devices buzz to scoop us on the latest, here, there and everywhere. And if we imagine ‘over there’ is so different, I suspect Grandpa would disagree. What did he think of Korea and Vietnam and the Middle East? What would he think now? I don’t want to turn away from the world, troubled as it is by easy answers and the slack fallacies so many base their world views on. I fear too many forget what our freedoms are, even if they acknowledge those who fought to protect them. I mean the freedom to choose to speak or to forget, freedom to remember and still move forward, freedom to live and work and love, to serve or not, and to retire and be cared for after a long and arduous life. In short, freedom to be. Freedom to be fearlessly kind. But anyway, thank you RSL. You didn’t restore to me the grandfather I loved because that’s impossible. No, you rehabilitated something of the part he played on the world stage that he himself left behind. That’s ok. This is the kind work of historians, and, being courteous, he wouldn’t have minded at all. He understood what lest we forget meant.